Maria Perez Cruz was born at Teruel in Spain on the 3rd of May 1917. Her parents were Manuel Perez de la Esperanza and Isabel Lacruz Civera, also originating in Teruel. Maria’s nick name of La Jabalina (which can be translated as The Javelin in English but also is the name for wild pigs) comes from the fact that her mother’s family were from the village of Jabaloyas, and this nickname was given to all the women of the family. Economic necessity forced the family to move to the port town of Sagunto in Valencia when Maria was only six years old. A railway linked Sagunto to the Teruel mines and minerals mined there were then shipped to other parts of Europe. There were serious problems of housing and health in the town and this triggered the first workers’ protests. The family settled near the municipal market. Maria and her five brothers helped the family by working at a vegetable stall in the market. She also helped her mother in the house and worked as a cleaner at the house of a local doctor. 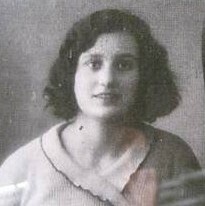 Angered by the condition of the working class in Sagunto, Maria joined the Libertarian Youth in 1934 at the age of seventeen. She joined the anarchist militia The Iron Column in August 1936. This had been put together from various groups, including Sagunto metalworkers. She served with it as a nurse, and helped set up a hospital on the front. During the Battle of Teruel on August 23rd 1936 she received a gunshot wound in the leg at Puerto Escandon, which fractured a femur. She then was hospitalised until December 24th at the Valencia hospital. After this she worked in an arms factory at Sagunto and then at Cieza in Murcia at a steel works. With the victory of Franco, she attempted to go unnoticed in Sagunto. She was now pregnant. On April 23rd 1939 she was arrested by the Guardia Civil. After questioning, where she was asked about who she knew in the Iron Column, her head was shaved and she was paraded through the streets, and then released. She was again summoned by the Guardia Civil on May 30th. She refused to sign a statement read out by the military judge, saying that some of the content was untrue. She was released but on the following day was imprisoned in the Sagunto jail. She was then charged during a military trial of “aiding the rebellion” and a whole list of deeds, most of which had occurred whilst she was hospitalised, including the assault on the Castellon prison when 11 warders were killed. One of the crimes cited was the murder of the Bolivian consul in Valencia (where no such consulate had existed), whist other murders, including eight priests and an MP, were assigned to her. Local Falangist leaders said that “she had not taken part in the atrocities” but a neighbour testified that “it was said” that she had taken part in the burning of a church. The Director of the Valencia Hospital vouched that she had been there in the period when these deaths happened. On November 4th she was transported to the Valencia Hospital because of the state of her health and her advanced pregnancy. She was released from there in January 1940 and returned to prison and later the provincial women’s prison. She was tried before a court martial on July 28th 1942 and sentenced to death. Ten days later on August 8th she was shot with six other male prisoners against the cemetery wall at Paterna. She received a bullet to the head and another to the chest. During her three years in prison she had been beaten and tortured but refused to own up to anything, apart from being the lover of Paco el Frances (French Paco), who may have been the Column’s war delegate in Sarrion. It is assumed she gave birth to a child on January 9th 1940, but nothing is known further of this child. Many children of prisoners of the Franco regime were given up for adoption, and this seems to have been the fate of the child. In 2003 a women’s association of the Baladre neighbourhood of Sagunto carried out a campaign Breaking The Silences which remembered Maria and others killed by the Franco regime. A square in Sagunto has now been named after her. Manuel Girona Rubio wrote a book about her “Un Miliciana en la Columna de Hierro”, published in 2011 and this was followed by a novel based on her life "Si me llegas a olvidar" by Rosana Corral-Marquez and a play written and acted by Lola Lopez, both in 2013.